Once, it was Quarterback U. Perhaps, it will be again. With senior Brad Kaaya at the controls, and with coach Mark Richt in charge, the University of Miami could harken back to the days of Bernie Kosar, Vinny Testaverde and Gino Torretta. 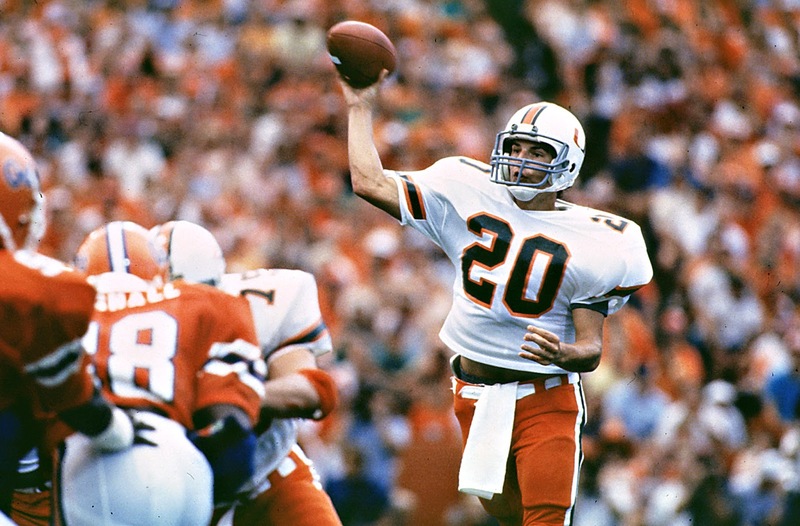 In those days, it was the quarterback who held things together as UM won its national titles. Testaverde and Torretta won Heismans. Lately, it hasn’t been the same for the team of the position. But as Kaaya enters the season, you can only wonder how high on the list he might get. 1. Bernie Kosar (1983-1984): The true run of excellence of the Miami Hurricanes started in 1983, and with Kosar. Kosar led the team to its most memorable win, a 31-30 upset of Nebraska, for the national title. Kosar would finish fourth in the Heisman Trophy voting before leaving for the NFL, as the No. 1 overall choice in the NFL draft. 2. Vinny Testarverde (1982-1986): It would be unfair to remember Testaverde for his NFL career. Testaverde won the Heisman in 1986 and led his team to the No. 2 ranking. Testaverde threw five interceptions in the national title loss to Penn State. 3. Gino Torretta (1989-1993): Torretta was a member of two national title game, and won the Heisman in 1992. 4. Steve Walsh (1985-1988): Walsh was 23-1 as a starter while at Miami, including a championship in 1987. He finished fourth in the Heisman Trophy voting and was a No. 1 draft pick in the NFL Supplemental draft. 5. Jim Kelly (1979-1982): In the days before titles, Kelly – an NFL Hall of Famer – was the quarterback for the Hurricanes. Kelly threw 33 touchdown passes, setting himself up to be a No. 1 draft pick by the Buffalo Bills. 6. 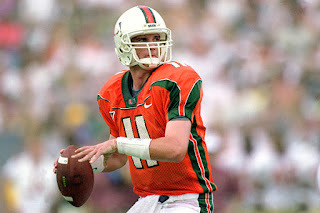 Ken Dorsey (1998-2002): Dorsey was 38-2 with the Hurricanes, winning a national championship and finishing second another year. He finished third and fifth in the Heisman race. In his career, he threw 86 touchdown passes. 7. Craig Erickson (1987-1990): Erickson was good enough to finish eighth in the Heisman Trophy. He started for two seasons. He was drafted twice by the NFL, in the fifth round by the Eagles in 1991 and the fourth round by the Bucs in 1992. 8. George Mira (1961-1963): Mira was an early star with Miami, finishing fifth and 10th in the Heisman Trophy race. His son, George Jr., later played linebacker for the Hurricanes. He was drafted in the second round by San Francisco and played eight seasons in the NFL. 9. Brad Kaaya (2014-present): Kaaya, still going with the Hurricanes, has received some light buzz for this year’s Heisman. If he can finally get his team past FSU, it has a puncher’s chance to contend in the ACC.